Although no one need worry that the (apparent) retirement of Hayao Miyazaki signals the end of beautiful creations issued from Studio Ghibli, co-founder Isao Takahata’s The Tale of the Princess Kaguya falls short of being a masterpiece. 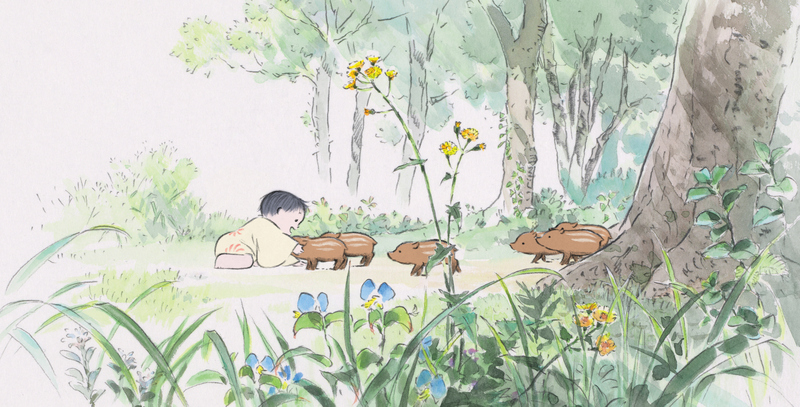 But neither is it a total misstep; Takahata’s eight year project doesn’t represent a break with the high standard of storytelling we’ve come to expect from Japan’s premier cinematic export. Indeed, Takahata’s understanding of film as storytelling is built into Princess Kaguya itself. Third-person voiceover combined with naïve illustrative animation makes the film feel close to its folklore origins; the visual style, which has been aptly compared to both watercolour and Japanese printmaking, is also akin to that of a children’s picturebook. 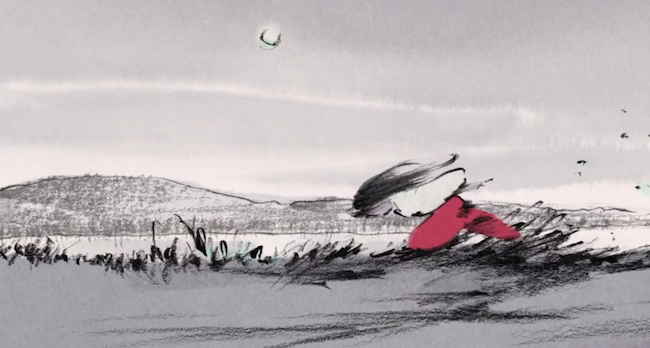 With the rural settings and a tendency to leave unfilled spaces around the edges – like a drawing blended into a page – watching Princess Kaguya is at times like falling into the Japanese equivalent of an Astrid Lindgren storybook. This quality characterises Princess Kaguya’s opening and most enjoyable portion, in which a bamboo cutter (Takeo Chii) discovers a Thumbelina­-esque girl inside a bamboo shoot. The bamboo cutter and his wife enthusiastically care for the supernaturally fast-growing girl, who will later be named Princess Kaguya. For the next 45 minutes or so the film is a rustic bildungsroman filled with vivid characters, comedic touches, and an affecting vocal performance from Chii as the girl’s committed adoptive father. As the central character ages, however, the film also becomes weary. Further magical discoveries in the bamboo glade herald the farmer’s realisation that his young daughter is of nobler status than he and his wife. 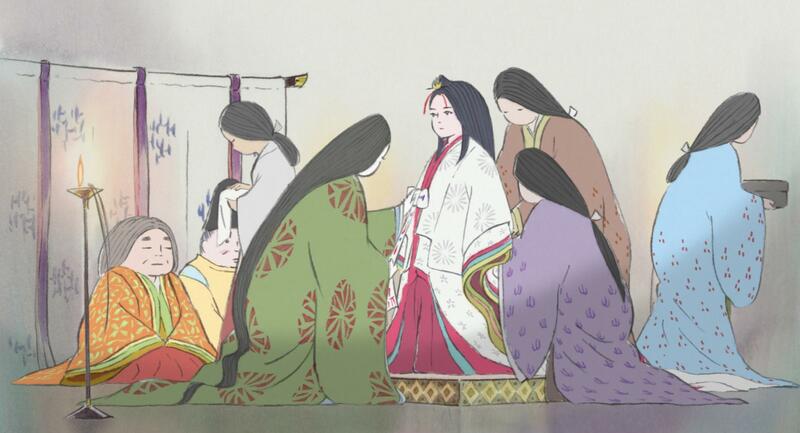 The film gradually deteriorates after the family relocate to a city where they can provide the young Kaguya with a lifestyle they consider more befitting of her royal nature. Although there’s a standout display of creativity in an abstract sequence which departs from the softer visuals used throughout, the plot ultimately descends into repetition and monotony. I can only imagine that Princess Kaguya’s superfluous length would have been even more tiresome had I watched the US dub, but even in the original language a prolonged run of almost-conclusions makes for a tedious final act. Ultimately, the film, while always gorgeous to look at, is a wildly inconsistent source of entertainment. The Tale of the Princess Kaguya echoes the bold colours and sparse lines used by nineteenth-century Japanese printmakers, such as Utagawa Hiroshige. 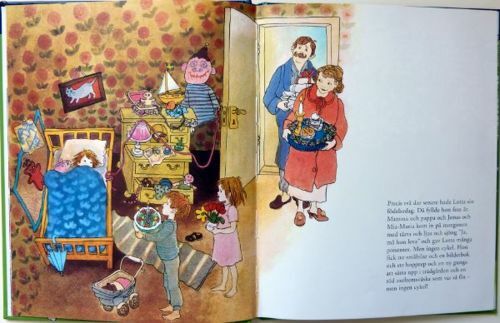 This entry was posted in Film Reviews and tagged Astrid Lindgren, Hayao Miyazaki, Hiroshige, Isao Takahata, Studio Ghibli, Takeo Chii, The Tale of the Princess Kaguya. Bookmark the permalink.